The world knows Superman is Clark Kent - and now, the mild-mannered reporter is a wanted man! And with threats to his freedom closing in on him, Superman must also face a new form of evil coming from Gotham City. Instead of finding the Batman he's always known, Superman is met by a strange, new Dark Knight - James Gordon! 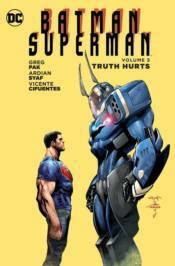 This title collects BATMAN/SUPERMAN #21-27 plus the Sneak Peek story from CONVERGENCE: BOOSTER GOLD #2.